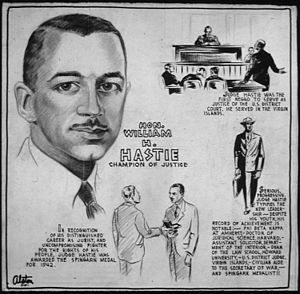 The first African American to be appointed to a lower federal judgeship was William H. Hastie, appointed by President Truman in 1949 to the U.S. Court of Appeals for the Third Circuit. Judge Hastie initially received a recess appointment from President Truman, but was later confirmed by the Senate in 1950. The first African American to serve as a U.S. district court judge was James B. Parsons, appointed by President Kennedy in 1961 to the U.S. District Court for the Northern District of Illinois. appointed by President Johnson in 1966 to the U.S. District Court for the Southern District of New York. appointed by President Carter in 1979 to the Second Circuit Court of Appeals. In the following years the number of African Americans serving as U.S. circuit and district court judges remained relatively low and remained that way until President Jimmy Carter created the U.S. Circuit Judge Nominating Commission in 1977. The commission was “encouraged to make special efforts to seek out and identify well qualified women and members of minority groups as potential nominees”. During the Carter presidency African American circuit court judges increased from two to nine, a 350% increase. As of January 1, 2015 the number of African American circuit court judges is 21. There is also an increase in African American district court judges. As with the circuit court judges, a significant increase occurred during the Carter administration. The current number of African American district court judges is 86 which is an historic high, and the most recent increase is largely attributable to an increase in the number of African American women appointed during the past five years. While this increase in African American circuit and district court judges is notable, there is a caveat. There are few or no African American judges currently serving in several judicial circuits and districts with populations comprised of relatively high percentages of African Americans and many advocates of judicial diversity consider this a crucial issue which needs to be examined.